What would a kitchen be without the distinctively aromatic smell and taste of different spices, bringing out the flavours of almost any type of cuisine imaginable? Spice add piquancy, tang and flavour to food and are versatile ingredients in all forms of cooking. The Secret Benefits of Spices and Condiments unearths a whole new world of hot and pungent Indian and exotic spices. It gives a detailed account of their origin, cultivation, chemical composition, medicinal and culinary uses. 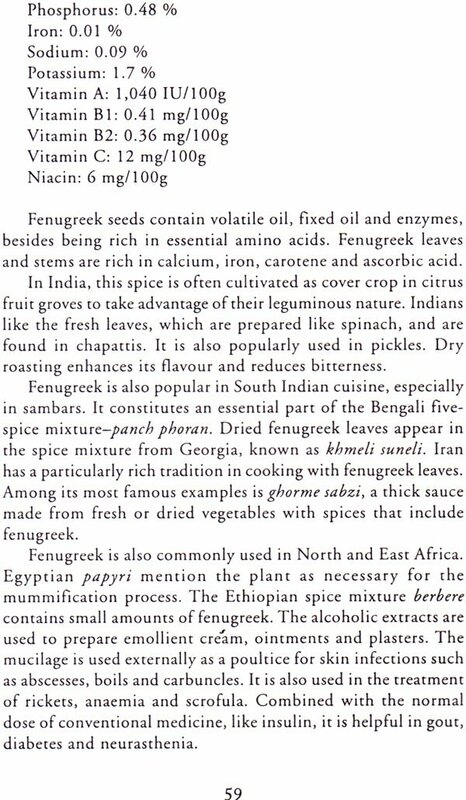 The book also discusses at length the use of various spices in different cuisines of the world like Japanese, Chinese and French. So pick up this book and discover the myriad varieties of spices which enhance the pleasure of eating. India is considered the Home Spices since ancient times. Although different spices are produced in different countries of the world, India has the privilege of producing all types of spices. In some spices like black pepper, cardamom and turmeric, India holds top position among the major spice producing countries of the world. Spices have been prized for centuries. In fact, they were once valued as highly as gold. There are accounts of how people followed the trails of early merchants in their search for spices. They explain how indigenous spices were traded, and were once a royal luxury. Today spices cost so little, and even more new and unusual varieties of spices are available. Exotic, aromatic and exciting spices add piquancy, tang and fiery flavour to food, and are a versatile ingredient to all forms of cooking. Spices are also useful as preservatives and antibiotics, and for their therapeutic benefits. Would it be possible to review this book before buying?